The X-Files is back on TV for a 6 part mini-series, with fans hoping it does well enough to get another full season of conspiracy, mysteries and cover-ups. The third episode in the mini-series, "Mulder and Scully meet the Were-Monster", was a very old school creature mystery hunt that was completely nodding to the original Kolchak the Night Stalker series from the 70s with everything from Guy Mann's outfit, so Mulder running around with this camera. I t is more than a nod in fact, because not only did the Kolchak series lend inspiration to the X-Files from the get-go, the Kolchak franchise was resurrected as "Nightstalker" in 2005 on ABC after the X-Files success. It was cancelled after 6 episodes, because it sucked and the ratings sucked. SyFy got a hold of all 10 episodes and aired them, but the show still sucked, and the ratings still sucked. Darin Morgan, the writer for the original X-Files series (and current producer for the Re-Opened X-Files), also produced Nightstalker. Darin Morgan had an original script for Nightstalker called "The M Word" (available to read here), which was never produced. If you give it a read you can see the script was jazzed up a bit and used for "Mulder and Scully Meet the Were-Monster", which is also directed by Morgan. The original Kolchak series duds thrown in there was my favorite part. I loved seeing that hat again! I really enjoy Kolchak, and seeing this episode of X-Files reminded me to dig out the old series to give it a watch. 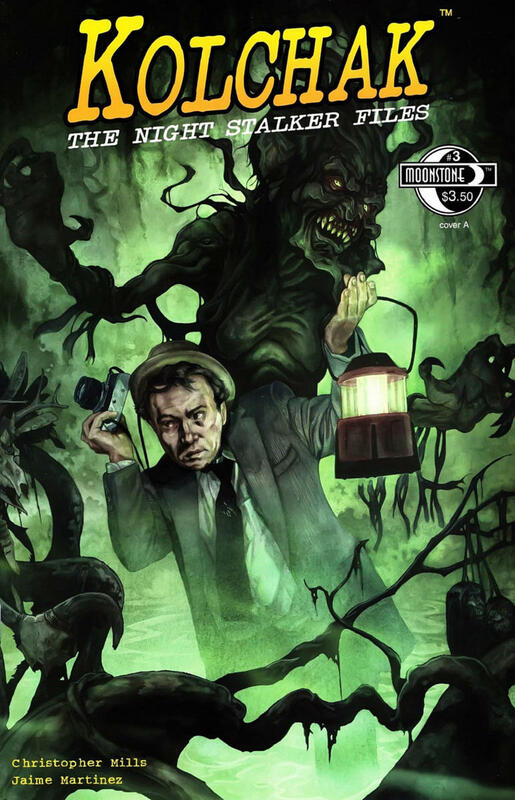 The Kolchak Comic Books by Moonstone Books (which have nothing to do with the show remake) are really awesome. I've enjoyed everything I read from it so far. If you are a fan of monsters, mysteries, supernatural and paranormal stuff, you should pick up some of them graphic novels that are floating around. It has also been said that there will be a Kolchak the Night Stalker movie in the future directed by Edgar Wright (Scott Pilgrim vs The World, Shaun of the Dead). The movie will be released by... Disney? Yep.. kind of a downer, considering the show featured monsters murdering people, drinking blood, eating flesh, succubi, and all of those gruesome things. Expect the movie to be made more family oriented. If it gets a PG-13 rating, that will be a miracle. Who is rumored to be attached to playing Carl Kolchak? Johnny Depp of course. Who else would be in a Disney movie? I think I'm okay with that, but wouldn't mind seeing someone else that doesn't get a lot of attention. Are you a fan of Kolchak the Night Stalker? What would you like to see done with Carl Kolchak?